Woodcock shot over Hera’s point October 14, 2015. This is Hera’s third season in the field and she is coming along nicely in her training as a gun dog. I documented the difficulties I had last season in the diary entry The terrible twos. In her second season, Hera manifested the symptoms of the “terrible twos” in breaking point and bumping birds before I walked up the point. She experienced a couple relapses of this behaviour at the start of this season, but today she made three staunch points on woodcock. I walked up each point and she held as we got the birds in a squeeze play. I got a shot away at the first bird she pointed and missed spectacularly. The second bird flushed under a tall cedar tree and did not offer a shot. Hera pointed the the third bird close to where the second bird was found in a mix of aspen, cedar and alder. This time I dumped it cleanly with my first barrel. What I look for in woodcock cover in the Marlborough Forest. Conditions in the woodcock coverts this season are not the best. Though the ground is not dry and hard; neither is it damp enough for the woodcock to easily probe for earthworms. I am not seeing the telltale splotches of woodcock droppings in the coverts. Hera finds and points many old scents each day we are hunting, which tells me woodcock are moving in, but not staying long. 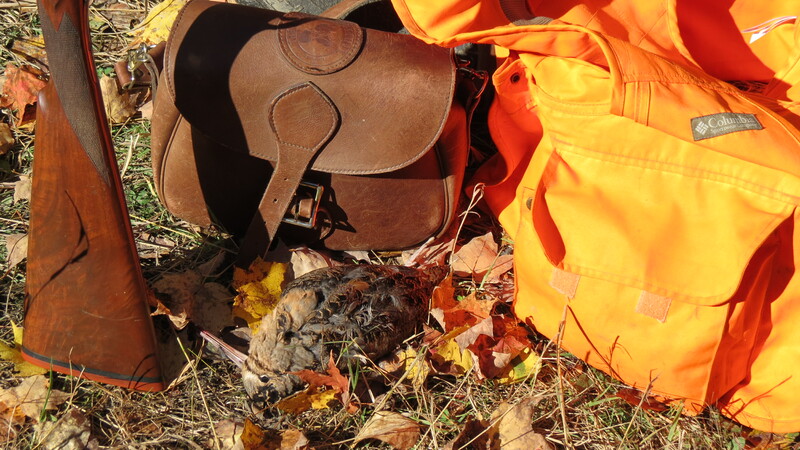 This is what I find in the Marlborough Forest and on the property I hunt near Spencerville. We are getting into birds most days afield, but not in numbers I experience when conditions are better. However, the birds we found this season were exactly where I expected they would be. She is getting the experience she needs to develop as a gun dog and I am patient with her, though it is frustrating when she stumbles onto birds, bumping them before she scents and points them. I remember this happening on occasion with the three dogs I hunted before Hera. It is an occupational hazard for pointing dogs. 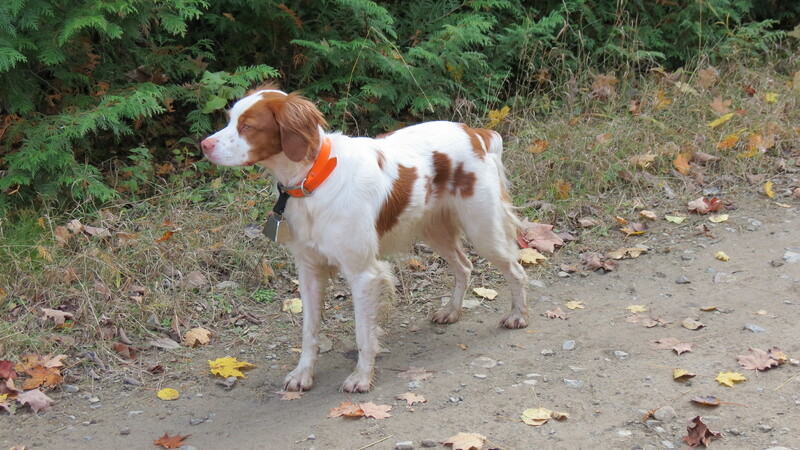 Hera hunting in the Marlborough Forest October 14, 2015. We will take to the field each day the rest of this week and with any luck will get into more birds. 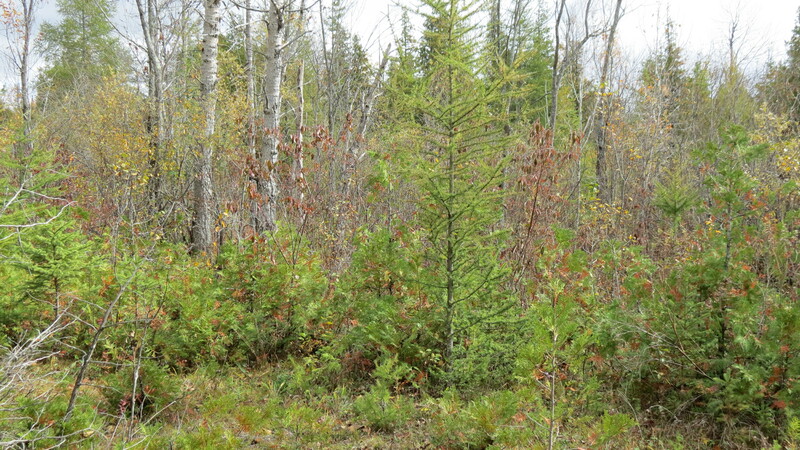 There is one spot in the Marlborough Forest I hunted in seasons past, but it is now part of the Rideau Trail. As I drive past the spot on my way to another part of the forest I remember hunting a particular patch of cedars there with my first two dogs. These days I leave the area to the non-hunting users of the forest, e.g., the bird watchers, hikers and cross country runners who frequent the area. Hunters are not the only ones using the Marlborough Forest and it is important that we extend courtesy to the non-hunting users of the forest. There is another patch of cover I want to explore as we head into the field tomorrow morning. I am hopeful we will turn up more birds, but whether we do or not, Hera and I will enjoy our morning afield. 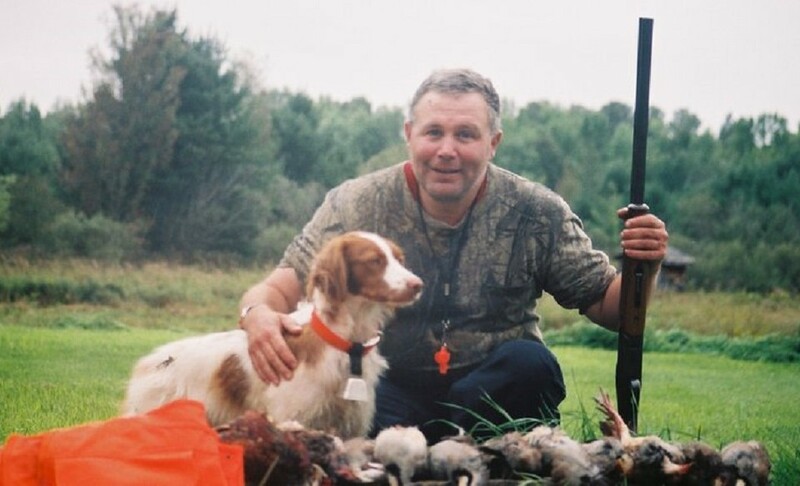 This entry was posted in Brittany (dog), Dog training, Gun dogs, Hera, Hunting dogs, Pointing dogs, Upland bird hunting, Wildlife habitat, Woodcock hunting and tagged alder, aspen, autumn migration, Brittany (dog), Brittany Hera, cedar, coverts, Hunting dog, hunting season, Marlborough Forest, migration, pointing dog, Woodcock on October 14, 2015 by geoffreyandmika.